JOHN C. McLEAN, ESQ., is one of the most prominent and progressive farmers of the section in which he lives, as well as an honored veteran of the late war. He resides in Lagrange Township, Bond County, and was born in Montgomery County, Ill., June 13, 1843. His father, William R. McLean, was born in North Carolina in 1823, and his grandfather was William McLean, a native of Scotland, who came to this country and settled in Guilford County, N. C., about 1800. He carried on farming there and died at an advanced age. The father of our subject was reared on a farm and came to Montgomery County in 1841, making the trip of course by wagon. Here he entered eighty acres of Government land and built a small frame house. This was one of the very first erected on the prairie in Hillsboro Township, and here he resided until his death in 1876. His gun was his trusty friend, and many were the deer he shot and the wolves he drove away. At his death Mr. McLean owned two hundred and forty acres of land which he had worked hard to secure and cultivate. His nearest market was St. Louis and to that city all grain and pork had to be hauled, and this necessitated a trip of five days with a night camp by the way. In 1876, he died, at the age of fifty-three years, after a useful and honest life. His religious convictions made him a Calvinist, and very strict was he in his ideas of right and wrong. In politics, he was a Whig, and later became a Republican, and attended to his duties as a citizen as faithfully as he performed every act of his life. The mother of our subject, Emily J. Barry, was born in Kentucky, the State that is noted for its beautiful women, and she was brought to Montgomery County when only a little girl. Her family consisted of ten children, and seven of these grew up. They are: John C., Samuel H., Nancy J., Mary J., Joseph R., Melissa J. and Ida E. This worthy lady is still living honored among her children, a devoted member of the Presbyterian Church. Her father was Richard Barry, a native of Kentucky of German extraction. His settlement in Montgomery County was among the first made there, and he became the possessor of two hundred acres of land before his death. Our subject was reared on a farm and attended the old log schoolhouse with its primitive appliances for educating the young of that day, and he was among the most studious of the pupils. When the Civil War broke out he was among the first to spring to the defense of his land, and October 1, 1861, he enlisted in Company E, Forty-ninth Illinois Infantry, and was mustered in at St. Louis and served in the Western division of the army. He was one of the valiant men who fought at Ft. Donelson, and Pittsburg Landing, and siege of Corinth, and then was put on patrol duty along the railroads for a long time; later he was in the battle at Little Rock and in the Meridian campaign with Sherman, and then was with the Red River campaign and took part in all the battles. His regiment was in the struggles at Coldwater, Miss., later was sent on the Missouri campaign after Price, and then to Nashville after Hood, and from Columbia, Tenn., to Paducah, Ky., where they were permitted to remain at garrison duty until the close of the war, when he was mustered out in September, 1865. Our subject is now in receipt of a $6 pension a month. After the war the farm seemed most attractive to Mr. McLean, and south of Hillsboro he carries on his agricultural pursuits. September 27, 1867, he married Miss Sarah E. Laws, who was a native of Montgomery County, and eight children have been added to the family, although Emma and Jessie are numbered with the dead. Those living are Freddie, Bertie, Clarence, Estie, Samuel and Charley. Our subject settled upon sixty acres of the old homestead and bought sixty acres more where he lived until 1881, when he sold there and bought his present place in the spring of that year. Here he has one hundred and sixty acres, and about all of it is improved and our subject has done the most of the clearing of it. He raises grain and fine stock and not only farms his own one hundred and sixty but about as much more which he rents. Mr. and Mrs. McLean are members of the Cumberland Presbyterian Church and in that connection are highly regarded. In his political belief he is a Republican and he has been in his present office of Justice of the Peace for the past four years. Also he is one of the three Road Commissioners, having miles of road to oversee and is now serving his third term in that office. He is connected with the Grand Army of the Republic Post in Greenville, and is one of the most highly regarded men of his section, his friends being legion. 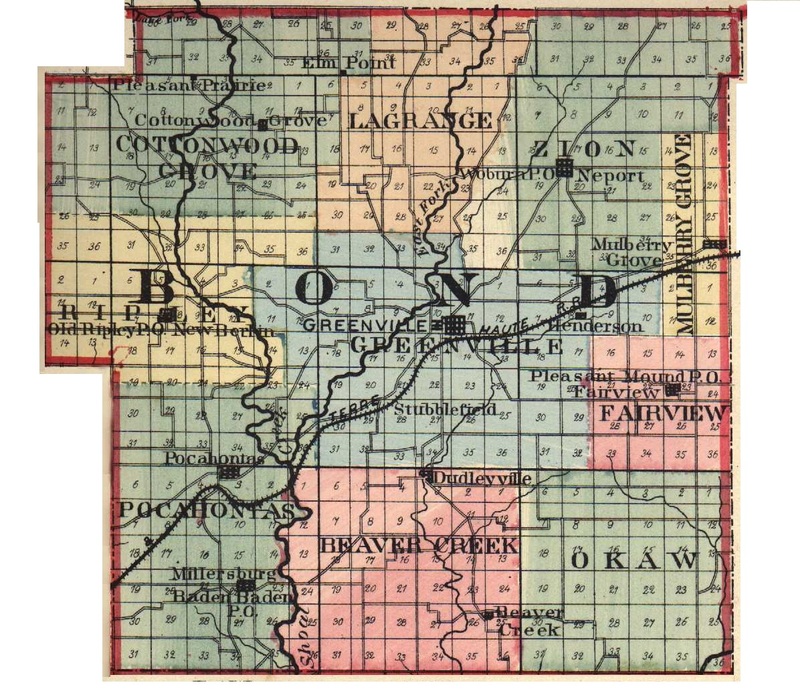 Extracted 29 Nov 2016 by Norma Hass from 1892 Portrait and Biographical Record of Montgomery and Bond Counties, Illinois, pages 136-137.